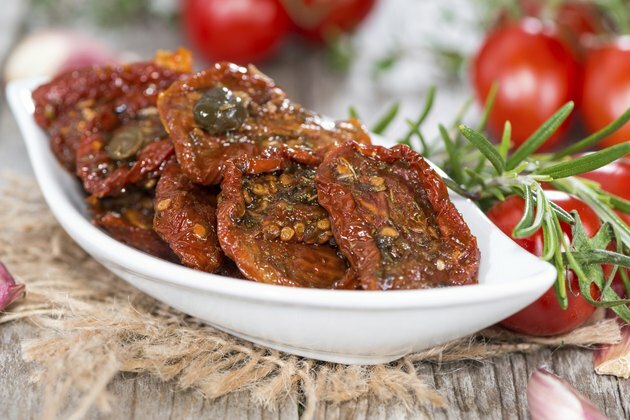 Dehydrated vegetables, with their harder texture and wizened forms, might not be your first vegetable choice, but drying vegetables is a safe, low-fat and long-lasting method of preserving them. One of the greatest benefits is that the nutritional content of dehydrated veggies is left relatively unchanged, so you can use them to help meet your daily vegetable intake of 2 to 3 cups of vegetables per day, as set by the U.S. Department of Agriculture. Dehydrated vegetables retain 100 percent of the calorie content of fresh vegetables while only taking up half of the space. Current dehydration technology can remove almost all of the moisture content in vegetables, leaving only 2 percent to 3 percent in the finished product. The removal of moisture also increases the storage life of the vegetables. The dehydration process exposes the vegetables to some heat. Although the temperatures are kept fairly low, some heat-sensitive vitamins, primarily vitamin C, are lost. Vitamin A is fairly well-preserved despite the heat exposure, so long as the temperature is kept controlled. Conventional cooking processes, however, will also cause a loss or destruction in these two vitamins. Water-soluble vitamins, such as B vitamins, may be lost during the rehydration process of dried vegetables, but they can be preserved if you use the soaking liquid during cooking. Dehydration preserves the full dietary fiber content of the vegetables, ensuring they remain a high-fiber food choice. Dietary fiber provides bulk to your diet and can help reduce the effects of constipation. Vegetables are naturally high in fiber, both soluble and insoluble; the former helps create soft bulk, while the latter helps speed up the passage of waste through your bowels. In order to use dehydrated vegetables, you need to reconstitute them, which typically requires soaking in water. But you can add dehydrated vegetables directly into high-liquid foods, such as soups, stews and sauces. Reconstituted vegetables often have a softer texture than fresh vegetables, so they are more commonly eaten as part of a finished dish, rather than on their own. Some Asian dishes, however, make use of the unusual texture of dehydrated vegetables to provide textural contrast.